Speculation about the possible signing of Brazilian playmaker Ze Roberto is heating up. According to this article, the 35 year old Hamburg midfielder has been offered a three year, $5million per year contract and the option of further employment with the Red Bull organization after retirement. There is a great two-page Red Bull Arena feature in today's NY Daily News from Filip Bondy. RBNY fans may want to pick up a copy. Please click here for the online version. 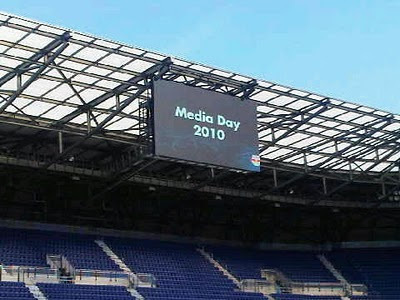 The first team practice at RBA will take place today (10am) and it will coincide with Media Day, also at RBA (1-3pm). The Viper's Nest staff is still patiently waiting for the press passes to arrive. Ha, ha!